Art Show Photo Exhibition in Bucharest: Alex Conu - "Northern Lights"
Tuesday, august 6, at 19.00, at the headquarters of F64, will take place the opening of the photo exhibition "Northern Lights", signed by photographer Alex Conu. The exhibition comprises 24 images, one of which was nominated among the finalists of the Astronomy Photographer of the Year 2013 competition. "Northern Lights" offers an adventure, in pictures, beyond the Arctic Circle, to a less tourist destination but beguiling as soon as you get there: Islands of Lofoten. Apparently an isolated area and unwelcoming, the Lofoten Islands are fast becoming the place where you always dream to go back. Alex Conu Lofoten Islands adventure started in March this year, with the thought to see and photograph the Aurora Borealis. It was probably the only phenomenon of nature that was missing from his portfolio as an astrophotograph. Alex returned home with photos of the Aurora, but also with an experience that deserves a fuller account. Lofoten Islands are a micro universe comprising friendly people, old traditions and Vikings legends. Alex Conu is one of the most appreciated Romanian astrophotographer, with over 15 years experience in photographing the sky. 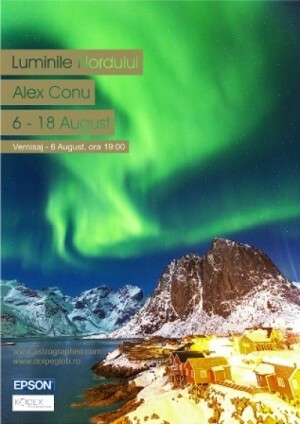 "Photo Exhibition in Bucharest: Alex Conu - "Northern Lights"" Art Show in Bucharest. You can get here description, reviews, address, time and details of "Photo Exhibition in Bucharest: Alex Conu - "Northern Lights"" Art Show in Bucharest. Visit Bucharest Tips for more Art Show events in Bucharest!